Over the past six years, since the start of the war in Syria, the gender dimensions of the refugee crisis have been analysed by academics and civil-society practitioners alike. Most such analysis has focused on gender-based violence, and in particular, violence against women. Some work has been done on the impact that the war has had on gender roles. There has also been research on women’s key role in peacebuilding, and reporting on their striking absence from formal peace talks on Syria. A Gendered Approach to the Syrian Refugee Crisis adds depth and detail to this picture. An edited collection, the book brings together a wide range of perspectives on the crisis, looking at gender dynamics in pre-war Syria, and relating the different experiences of women refugees in Istanbul, Lebanon, Cairo, and the UK. It discusses women’s realities during the often dangerous journey from Syria through and to other countries, and analyses the effects that stereotypes of womanhood and manhood have on the everyday lives of Syrian refugees. Two chapters of the book focus specifically on the situation of Syrian refugees who are LGBTI persons. Gathering these diverse perspectives together in one volume is valuable, and helps broaden the understanding of how much gender identity shapes refugeehood. 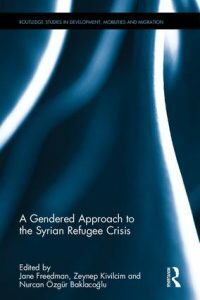 However, the greatest contribution the book makes to the debates on gender and the Syrian refugee crisis lies in the truly intersectional way in which many of the chapters explore the issue. They do this by analysing a number of gendered phenomena that are not specific to this crisis, but which manifest concretely within it. For instance, both when giving a historical overview and when analysing the current situation, several of the authors highlight how a person’s economic situation shapes the experience of being a woman or a man – and consequently, also the experience of being a refugee. Chapter 5, for example, makes clear that even in pre-war Syria, the degree of freedom in terms of sexual orientation and gender identity was always dependent on the level of wealth and wasta (connections and clout) that an individual had. The book reveals, across several chapters, how personal finances continue to permeate the performance of gender. In Chapter 10, Jennifer Allsopp analyses the gendered tropes and stereotypes that are projected on to men, and the effects that this has in the lives of Syrian refugees. The author describes how different and sometimes contradictory identities – victim but also potential aggressor, provider but also absentee father – are ascribed to male refugees. She notes that ‘many of the complexities of modern masculinity are pulled to the surface in migration and refugee movements’ (p. 155), and states that it is at the border between nation-states that the starkest manifestation of this ‘clash of masculinities’ occurs (p. 163). The book also raises another important but too rarely discussed issue, namely the structural violence that is exercised through administrative procedures and directives. Nurcan Özgür Baklacıoğlu’s chapter, ‘The Violence of Tolerated Temporality’, takes the case of Turkey as an example. It shows how administrative measures result not only in Syrian women refugees being denied access to health, education, and social and employment services, but also in them being placed outside international protection regimes. The result of this exclusion is not only the perpetuation of poverty. When combined with the kind of tropes and stereotypes that have already been mentioned, and are further discussed below, such structural violence creates and reproduces hegemonic masculinity. When the state and international/national NGO systems internalise gendered and racist stereotypes about aggressive masculinity and vulnerable, passive femininity in Syrian refugees, the consequences are sometimes deadly. The book raises the example of when assumptions are made that certain forms of violence against women are ‘cultural’ practices which cannot or should not be questioned, rather than being the products of particular economic, social, and political contexts. In practice, this means that such violence is not properly addressed by the entities that should be protecting refugees. Consequently, the stereotype itself excludes women from accessing services and information, and becomes a self-fulfilling prophecy. This volume provides insights and food for thought on a number of issues, and takes a deeper look at concerns that are often only partially or superficially examined when this crisis is discussed. The book is written in an accessible way, and is recommended reading for anyone interested in deepening their understanding of the gender dimensions of the Syrian refugee crisis.